Most of us in the Apple community have always had a full understanding that Macs hold their value and generally outlast PCs by a long shot. Although no computer is immune to failures and manufacturing defects, modern Macs have something that their PC counterparts do not - special attention to aesthetics, software interface, and superior engineering across the board, from case to the OS to the last tiny screw used. With these factors and the stability of Mac OS X, combined with many applications that "just work", modern Macs certainly hold their value - even the late PowerPC machines manufactured five to six years ago, and especially notebooks. What does that mean to the typical PC consumer who is thinking about switching and wants to try a Mac, but is used to cheap, disposable PC pricing? Quite frankly, the price of a new Mac is one of the most common deterrents to switching. If you are impartial to the interface, aesthetics, and OS, there are always Windows options selling for much less. Thankfully, there are affordable Mac options out there if you look hard enough, especially on eBay. As chance had it, I recently had the opportunity to find out if there was enough interest for a Mac from several family members who were all in need of a laptop. After I came across a lot of five 14" 1.42 GHz iBook G4 units on eBay, I couldn't resist! After discussing details with the interested parties, I generated commitment from three family members. That was enough for me to go for it. I placed a bid and won the lot for just over $1,100. Although I had to buy power supplies and some RAM upgrades, I was still able to keep the cost of the iBooks under $300 each with maxed out RAM (1.5 GB) and original 65W Apple power supplies. This was easily a savings of about $100 each over market value. 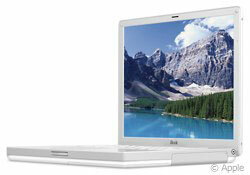 Compare the 14" 1.42 GHz iBook with any netbook in the same $300 price range. This top-of-the-line iBook running Mac OS X 10.5 "Leopard" with its adequate 14" 1024 x 768 screen, maxed out with 1.5 GB of RAM, Core Image capable Radeon 9550 graphics, along with Bluetooth, a scrolling trackpad, a 60 GB hard drive, and AirPort Extreme certainly has enough features to make it a viable computer for several years to come. 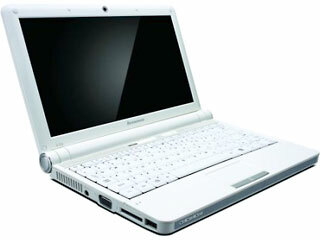 Compare that with a 10" 1.6 GHz netbook with Windows XP, a shrunken keyboard, 1 GB of RAM, integrated graphics, and a 1024 x 600 screen, such as the Lenovo S10-2 that Tommy Thomas reviewed on Low End Mac yesterday. The moral of this story is that sometimes you can buy in bulk to satisfy the needs of several people and pass along the savings. This also holds true for Macs when the deals are there. Schools, governments, and universities are always selling used lots on eBay and through other public auctions. Down with cheap disposable PCs! Spread some Apple Joy instead!